Grosset & Dunlap, NY Published with the Approval of the Boy Scouts of America, , 1918. HBDJ, 1918, Green Cloth Cover Lettered in Brown with Black Outline SPOTTED , , Soiled & Light Stains, GOOD-/GOOD, SOLD AS-IS, Spine Cover Nice Condition, covers show extensive water damage which fortunately did not effect either the text or the DJ greatly, page edges foxed, some light staining to e.p.s., prev. own. name half-title, int. is clean, DJ chipped and rubbed along folds and tips of spine, lt. staining along flaps, , 206 pgs. + 3 pages of Juvenile ads at back, DJ relatively Nice condition but Chips from Edges & SPINE ENDS Small Chips Tears, DJ back light FOX Soiling, Wear, Interior nice Clean light F0X, Wear, . Boy Scouts of AmERIca, ( mOTORCycle ) One of series of Tom Slade books--a very popular book in tHE eArly 1900's. 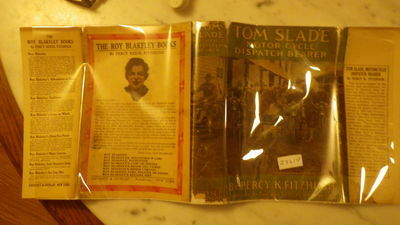 Book tells of a series of typical boy adventures of Tom slade.. Hard Cover.